Bob’s Red Mill Wonderful Gluten-Free bread mix once again over here in the Give It A Whirl Girl Kitchen. This time I was craving a peanut butter & jelly sandwich so I ventured into the kitchen to make my own loaf of bread. I also had some jars of Sunbutter Sunflower Seed Spread that I needed to try out and a jar of Herkner Farms Champagne Raspberry Preserves that I picked up at Devries & Company 1887. I had all of my ingredients and all I kept thinking about was how this would be the greatest wannabe peanut butter & jelly sandwich of all time. This was my first time giving Sunbutter a whirl and I was so excited to try it. Oh boy… I am blogging about this Wonderful Bread Mix once again! Let me tell you this… this gluten-free mix truly is wonderful and that is why it is in the name of the product. I have a problem getting my gluten-free breads to fluff up when I use my own recipe and ingredients. Maybe it is just me but my gluten-free bread do not rise up much. Bob’s Red Mill does include a yeast packet with the mix and that is probably why this mix results in a soft and fluffy loaf with the perfect bread crust. I had a wonderful feeling that this fluffy bread would pair well with my Organic Sunbutter Spread. For this loaf of bread, I wanted to dress it up a bit. I did add one teaspoon of vanilla extract. I also added in 1/4 cup of ground flax seed. I then topped it off with gheeÂ (because ghee makes everything better) and put some ground up raw almonds on the outer crust. The ground flax gives this bread a great amount of added fiber while the raw almonds are a great source of added protein for the bread. I know. It is not a pretty photo but this is what the bread looks like before it is baked. I brushed a good layer of ghee on it. Sunbutter Organic Sunflower Seed Spread is an awesome alternative to your average peanut butter. I was super impressed by how easily spreadable it is and how creamy the texture of it is. This spread is created from roasted sunflower seeds. It is an allergen-free alternative to peanut butter among other common allergies as listed below. Free of common food allergens: peanuts, tree nuts, milk, eggs, wheat, fish, shellfish and soy, as well as being gluten, sesame and GMO free. Sunbutter is also a great alternative to peanut butter because in the Organic Sunbutter there are no-added sugars. They are a bit high in calories though coming in at 210 per two tablespoon serving. You will get 7 grams of protein though and they are low in carbohydrates. I had a Groupon for DeVries & Company 1887 so I decided to buy a few unique items while I was there. Because I am raspberry-obsessed the Champagne Raspberry Preserves by Herkner Farms totally caught my eye. It was a bit on the pricey side but I do believe firmly in you get what you pay for so I figured that the quality and taste would justify the cost. I sure nailed it on this one too. This champagne raspberry jelly was some top-notch stuff. I layered it on my slice of bread so thick and that is fine with me if it oozes out. Just use some napkins! On their website they suggest blending the jelly into your next bowl of yogurt. I think that is a grand idea and I will definitely be taking advantage of that suggestion. I think this would also be a fab topping for a bowl of nice-cream. I spread the Sunbutter and Jelly on pretty thick (the more the merrier, I say) as you can see in the photo below. I will tell you this, it did require a lot of napkins but I ate every morsel of this Sunbutter & champagne raspberry jelly sandwich. Truth be told, I have never had a warm pb&j (or should it be SB&J??) like this. I have always eaten my sandwich on the cold side. 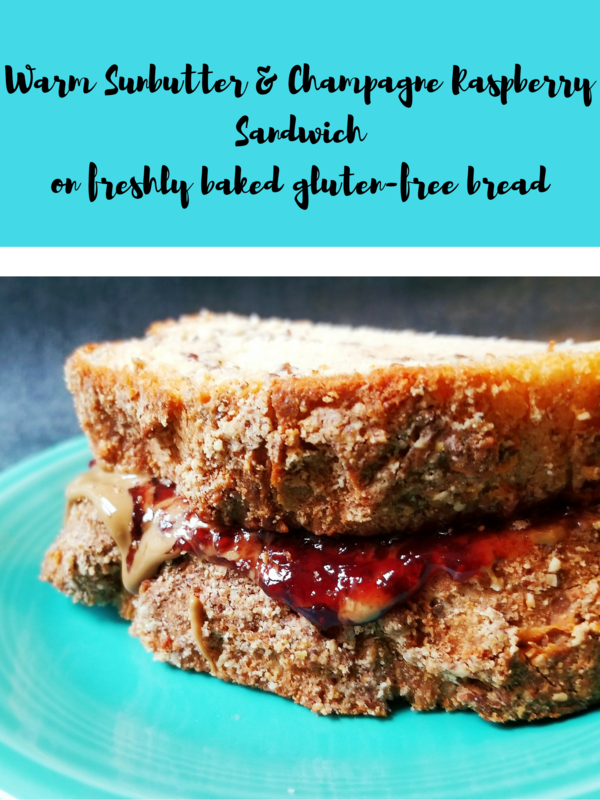 My dad always raves about how great a grilled pb&j sandwich is and I will assume he is right because eating this sandwich with warm, freshly baked bread was amazeballs! I try not to overuse the word amazeballs and only reserve it for something extra special like this! The Organic Sunbutter Spread was also very pleasant and enjoyable. It was quite similar to peanut butter. I loved how easy it spread on my bread slices. I get frustrated when my peanut butter or almond butter isn’t spreadable. I would definitely recommend Sunbutter to anyone with a peanut allergy. It is a fantastic alternative. Have you ever tried the Wonderful Bread Mix or Sunbutter? Leave me a comment and let me know what you think of these products! If you would like to check out more of what DeVries & Company 1887 has to offer (that is where my fancy jelly came from) you can pick up a Groupon and get a great deal over there. It is located in the Eastern Market area of Detroit and one of my favorite stores to shop at for food. You should definitely check out their cheese offerings available there if you are a fan of cheese! This entry was posted in My Cooking Journey, Product Reviews and tagged allergen free, baked bread, baking, bobs red mill, bread, bread mix, champagne, DeVries & Company 1887, eastern market, gluten free, glutenfree, Groupon, Herkner Farms, jam, jelly, lunch, peanut butter and jelly, raspberry, sandwich, sunbutter, wonderful bread mix. Bookmark the permalink.